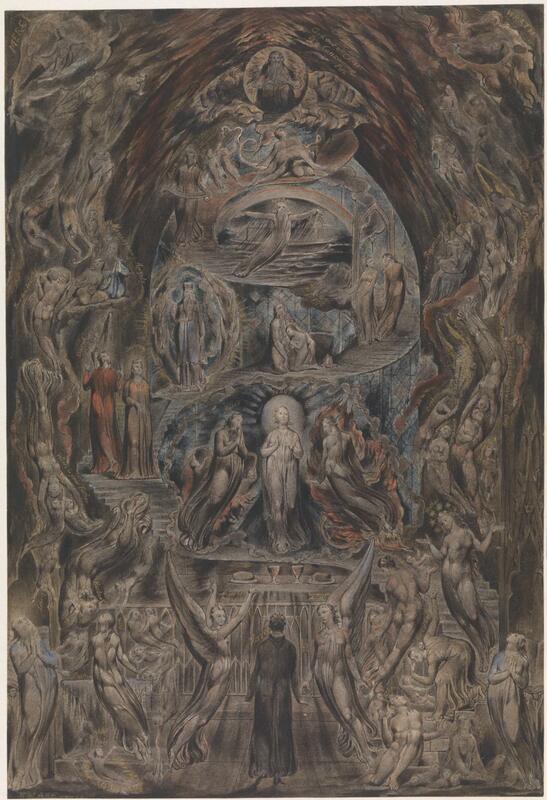 Several of William Blake’s paintings contain many different figures, and so far I have carefully avoided trying to identify them, and explain their significance and reading. This article takes one painting for which there is an inscription with a key: The Epitome of James Hervey’s ‘Meditations among the Tombs’ (c 1820-25), now in the Tate, in London. James Hervey (1714-1758) wrote several now obscure devotional texts which Blake admired. Although he came into contact with John Wesley and Methodism, Hervey was deeply Calvinist, and for the last few years of his short life was a priest in a parish in succession to his father. Hervey’s influence on Blake is most apparent in the poem The Tyger. This painting is an expression of Blake’s admiration, and of his sadness at Hervey’s early death. James Hervey himself appears at the centre of the foot, his back turned to the viewer. To the left of him is the Angel of Providence, and to the right Hervey’s Guardian Angel. Unusually, Blake avoids a symmetric design. At the far left, a Sage, dressed in blue, prays earnestly, and a baptismal party of husband, wife and baby are gathered around a font. At the far right, also in blue, is the Virgin, with a widow, father, and two Angels of Death. Above Hervey is an altar laid out for communion, with bread and wine. The next tier up Blake’s staircase to heaven is centred on the haloed figure of Jesus Christ. On the left is Moses, and on the right Elias (Elijah), two major prophets from the Old Testament, who together form the Transfiguration Group. Moses represents the divine law, and Elias divine vision. On the stairs to the left, in red, are Solomon (descending) and David (ascending). Further to the left are ‘Where is your Father?’, and below them members of the baptismal party. At the right is the mother (with stars around her head), above whom are ‘Sophronia died in childhood’, an orphan, a Protecting Angel, and ‘she died on her wedding day’. The next tier up is centred on ‘Abraham believed God’, one of the major incidents of the Old Testament shown as illustrations of ways that we can or cannot achieve salvation. To the left in blue is Aaron, and to the right the mothers of Rebecca and Leah (heads cropped in this detail). At the far left is ‘these died for love’. The centre of the next tier shows Noah, in flight over the waters of the great flood, and with his Ark and the rainbow of God’s covenant behind. Curiously, on this occasion the rainbow is shown in normal (Newtonian) order, although this painting was made well after 1803 when Blake changed his convention to showing rainbows in reverse order. To the left are Ministering Angels, and at the right Recording and Protecting Angels. The heads of the mothers of Rebecca and Leah are visible here closer in to the centre, at the bottom of this detail. Dominating the top of the painting is, of course, the figure of God, here God out of Christ is a Consuming Fire, inside a spherical bubble. Immediately below God are Adam and Eve, with the Serpent, Cain and Abel as children, and Enoch. To the far left are indistinct figures which do not have any entries in the key, and the word MERCY. Similarly on the right, with the word WRATH. Above God is the fire which fills this part of the picture, and the inscription God out of Christ is a Consuming Fire, which is taken to be a variant of Hebrews chapter 12 verse 29, which has been quoted by Calvinists to prove the existence of Hell. Blake is here not showing one of his mythological variants of God which he associated with his negative opinions of established religion, but a God of righteous anger, dispensing wrath tempered with mercy. In his mythology, Blake had several different forms of God. There is ‘God is Jesus’, the Human God, imagination, creative power, and truth. There is an ‘abstract God’ of the Prayer Book of the Church of England, a logical abstraction without passion or parts. The ‘angry God’ is the jealous God of the Old Testament, who dwells high above in heaven. He gives the Law, and punishes its transgression – a God of wrath, tempered by mercy. Blake also gave him the name of Nobodaddy (“nobody’s daddy”), although that tends more to apply to the false God of this world rather than the one shown here. The ‘god of this world’ was also used for Satan, who Blake considered was worshipped by the worldly. 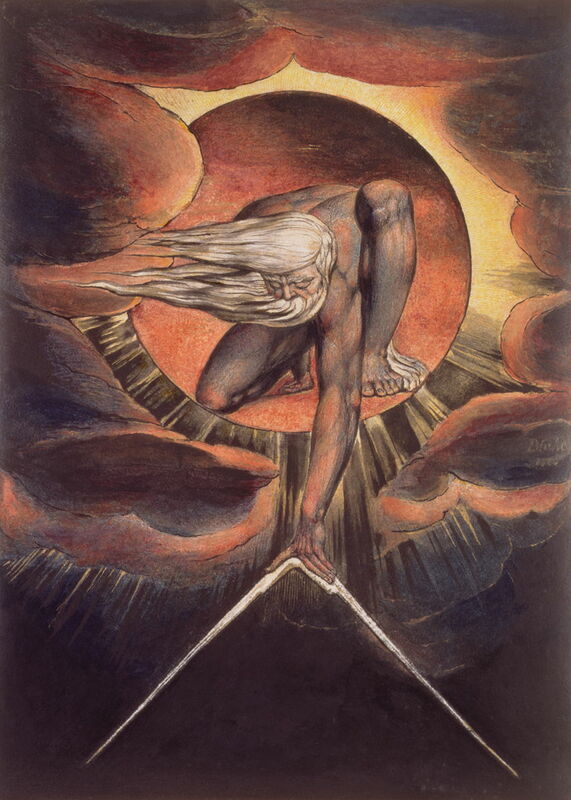 Other names which Blake used for variants of God include Elohim, the creator and judge of the early part of the Old Testament, and Urizen, who was in some respects a form of Satan. Posted in General, Painting and tagged Blake, Hervey, myth, painting. Bookmark the permalink. Last Week on my Mac: The fate of Yahoo!